If you're looking for a new way to broaden your crafting skills while pampering yourself, consider learning how to make massage oil. It's a fun, relatively simple craft that teaches you the basic principles of aromatherapy. It's cheaper than buying commercially-prepared massage oils. The product can be customized to fit the preferences of the person receiving the massage. If you're interested in making soap, body lotion, or other complimentary crafts, you can create themed gift baskets for friends and family. Since essential oils are highly concentrated and cannot be applied directly to the skin, you'll need to use some sort of carrier oil to create your homemade massage oil. 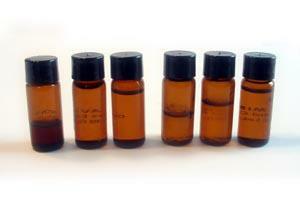 Since these oils are scentless and non-reactive, they are much cheaper than essential oils. Common carrier oils used to make massage oil include grapeseed oil, apricot kernel oil, safflower oil, and sweet almond oil. When making your own massage oil, you'll also need to purchase some type of container in which to store your final product. Brown or dark blue glass bottles with tight-fitting caps are recommended, since oils can become contaminated when stored in plastic containers or exposed to light. Do not use homemade massage oils on children under two. Consult a doctor before massaging a pregnant woman. Don't apply massage oil to skin that is infected or injured. Since essential oils can cause skin irritation, it's best to wear disposable surgical gloves when mixing your homemade massage oil.